Olivia Harper Wilkins is a second-year chemistry graduate student at Caltech using radio astronomy to tune into the invisible universe and solve some of the mysteries of astrochemistry. Specifically, she is interested in learning how complex organic molecules—considered simple by Earth’s standards—formed in the interstellar medium. The night is clear: clear of clouds obscuring the dark sky, clear of the veil of light pollution, clear of all sounds except those of a cricket happily chirping nearby. You lay on your back, the cool blades of grass holding you up as you stare into a black canvas dotted with tiny specks of light. A gentle breeze rustles distant leaves in the middle of transitioning into hues of red and orange. While you cannot see their vibrant colors in the night, your gaze falls on another source of striking red: the dagger of the hunter Orion, just visible below his belt. You sigh peacefully. Everything seems so simple. The Orion constellation, one of the most recognizable in the night sky. Faint lines illustrate the shape, reminiscent of a hunter and his bow. And yet it isn’t. The grass, the leaves, and the cricket are all composed of a complex network of chemistry, a dance between molecules from just a few to hundreds of atoms in size. Even the air and earth surrounding you—the ultimate example of complexity—play host to a rich display of chemical cycles. And all that complexity originated in a faraway cloud of interstellar gas and dust, like the red dagger of Orion. The study of chemistry’s progression from interstellar space to planet formation is called astrochemistry. Astrochemistry involves the study of chemical signatures traveling across space from molecular clouds, exoplanets, and other celestial objects hundreds and even thousands of light-years away. Because these objects are so far away, the time it takes for these signatures to travel, even at the speed of light, is immense. Thus, astrochemistry is looking into the chemical past of our universe; it’s chemical archaeology… in space. One of the biggest mysteries in astrochemistry is understanding how complex molecules in the interstellar medium (ISM) evolve into even higher degrees of complexity, including the chemistry that constitutes life and our world as we know it. Because interstellar space is such a harsh environment, “complex” in this context refers to molecules having six or more (and generally fewer than 12) atoms. By this definition, compounds such as methanol, which many lab chemists use without giving it much thought, are remarkable molecules in the ISM. As it turns out, all interstellar molecules falling into the definition of “complex” are also organic, meaning they contain carbon and (usually) hydrogen. They are often classified as being either “saturated,” having many hydrogen atoms, or “unsaturated,” having relatively few hydrogens. They also often contain other atoms, such as oxygen or nitrogen. How life on Earth could have evolved from such simplicity scattered about talcum-powder-sized dust grains suspended in a molecular cloud under extreme conditions certainly has astrochemists scratching their heads. But as with any great mystery of the present, astrochemists look back in time (and across space) to dig up the answer from history. The astrochemist’s digsite is an ancient molecular cloud (ancient as in emitting light that takes thousands of Earth years to reach us), a region of space that is a nursery for stars and, ultimately, planetary systems. In a sense, these nurseries are interstellar laboratories of gas and dust that represent the earliest stages of chemical evolution that has resulted in our very existence. Molecular clouds—where temperatures fall in the chilly range of 20 to 200 K (-425 to -100°F)—are made of cold, dense gas and dust that eventually collapse into a protostar that hungrily accretes more and more matter as it develops into a star. 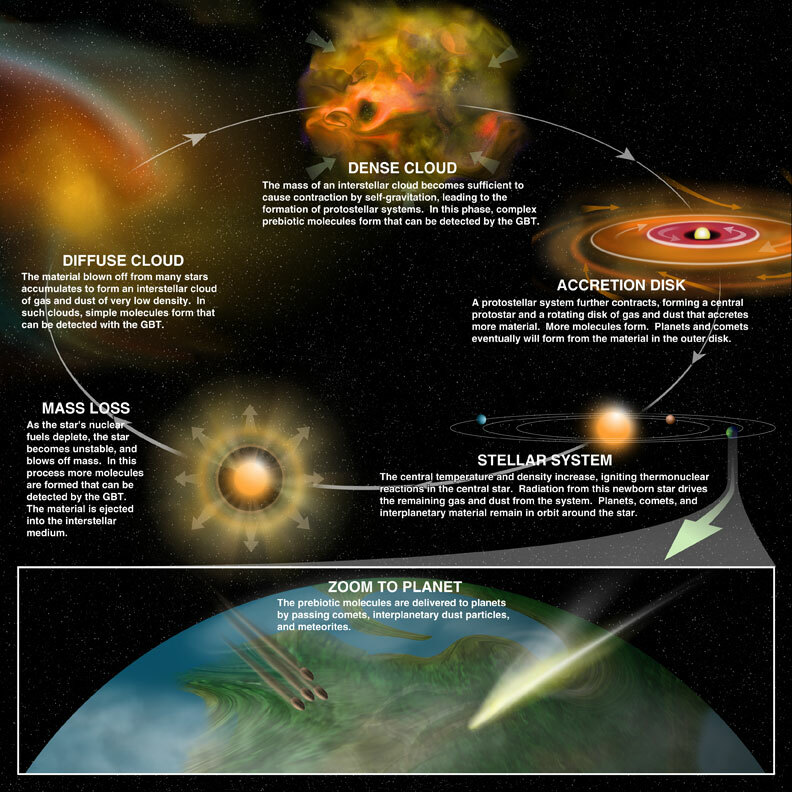 Along the way, the dust and gas falling into the protostar come in with angular momentum that leads to the formation of a rotating protoplanetary disk of dust and gas. Portions of this disk eventually snowball to form planets . Because the gas and dust are so cold in the far reaches of interstellar space, many of the dust grains are covered in ice before the gas warms preceding cloud collapse. One theory for complex organic molecule (COM) formation is that individual atoms bombard atoms and simple molecules embedded in ice grains, gradually growing into relatively large chemical species that are released into the gas phase as the grains warm. Other theories suggest COMs form in the gas phase, perhaps through ion reactions. While these are often separated, it is widely accepted that the chemistry between these two media is an intimate one, and perhaps COM formation relies on a combination of gas and grain chemistry. Illustration showing two ways that complex organic molecules are thought to form in space. In the case of icy grains, these signatures take the form of infrared (IR) spectra, which rely on the vibrations of embedded molecules energized by passing starlight. These spectra are obtained by infrared telescopes launched into space—such as the Spitzer Space Telescope or the highly-anticipated James Webb Space Telescope (JWST)—where they can observe icy environments unhindered by infrared absorption in Earth’s atmosphere. An illustration of the James Webb Space Telescope, a new telescope that will launch into space in 2019 and give scientists an unprecendented view of the distant universe. The gaseous ISM, however, is observed by radio telescopes such as the Green Bank Telescope (GBT) in West Virginia. These are ground-based telescopes with large parabolic dishes that tune into the universe’s hidden radio waves. These radio waves are generated by the free vibrations and rotations of molecules tumbling in interstellar gas before traveling across the galaxy and through Earth’s atmosphere undisturbed—except, perhaps by an orbiting satellite or a stray cell phone signal. For this reason, radio telescopes are often built in valleys or on mountaintops far from cities using the surrounding mountains and trees or sheer isolation as buffers from radio frequency interference, allowing them to pick up even the faintest signals from molecular clouds hundreds of lightyears away. The Green Bank Telescope, located in West Virginia. The telescope is at the center of a radio quiet zone, where all transmissions are limited to allow scientists to pick up faint signals from space without interference from humans. From these telescope data, we can calculate the abundances of, say, carbon monoxide (CO), from which oxygen-bearing complex organic molecules like methanol (CH3OH) are thought to be formed on the surfaces of icy grains. But merely detecting CO and CH3OH in the same regions of space is not enough to confirm that CO is a parent species of CH3OH. Like archaeology, which sometimes uses carbon isotopes to understand the human past via carbon dating, I am looking to understand our chemical past using carbon isotopes in a different way. Isotopes are variations of the same chemical element that are identical except for the number of neutrons in their nuclei. For example, every carbon nucleus has six protons, but carbon nuclei can have as few as two to as many as 16 neutrons. The atomic weight of isotopes—the sum of an atom’s protons and neutrons—thus varies as well. Of the 15 carbon isotopes, only three are found in nature. Two of these, namely the primary isotope carbon-12 (12C, or simply C) and the far less abundant carbon-13 (13C), are stable, while the other, carbon-14 (14C), is radioactive. Author's illustration of the three naturally-occuring isotopes of carbon. Isotopes are different forms of an element, which provide signals of the universe's chemical past. Perhaps the most widely known use of carbon isotopes is that of carbon dating, which relies on radioactive 14C. While 14C occurs naturally in organic material, its radioactive nature leads to it decaying over time. That is, the older an object is, the less 14C it will contain. By comparing the 14C/12C ratio in an object containing organic material to the 14C/12C ratio in the atmosphere (which is taken as the starting ratio in the object being studied), archaeologists can figure out how old something is from how much 14C has decayed. Ratios of carbon isotopes can also be used to learn about chemistry that happened in the interstellar past, but with some key differences. First, my astrochemical methods rely on the stable isotope 13C, which does not undergo radioactive decay like 14C. Second, because 13C doesn’t undergo decay, the 13C/12C ratio remains fairly constant over time. Thus, instead of telling me when a reaction took place, the 13C/12C ratio tells me how—and often where—the chemistry of interest happened. Theoretically, complex organic molecules (COMs) that formed on ice grains should have the same relative isotopic abundances as the grains on which they formed. By comparing the 13C/12C ratio of gaseous COMs to the 13C/12C ratio in nearby protostellar ices, we can test whether those COMs originated on the surfaces of icy grains. For instance, if methanol is in fact formed on the surface of CO ice, then we’d expect the 13CH3OH/12CH3OH ratio in nearby gas to be the same as the 13CO/12CO ratio found in the ices. My journey, however, is a challenging one for two prominent reasons. The first challenge is that I am limited to observing gas in clouds for which icy abundances are already known. Comparing gas from a protostar in the Perseus molecular cloud to icy grains in the Taurus cloud cannot reliably tell me about interstellar COM formation, just like comparing the stones that make up the Egyptian pyramids to clays in Central America will not help an archaeologist understand building materials made along the Nile. The second challenge in using isotope ratios to understand interstellar chemistry is that 13C is far less abundant—an estimated 60 times on average less abundant—than 12C. This means that for most COMs which are difficult to observe as it is, their 13C counterparts will be even more difficult to see, if at all. If these observational challenges can be overcome, however, 13C/12C ratios could be key artifacts in the quest to learn how some of the earliest molecules came to be. Nevertheless, I dig through the data, hoping to capture a glimpse of the chemistry that very well could have resulted in you and me. As an astrochemist, I am fulfilling my childhood dream of becoming an archaeologist by digging into the evolution of chemistry hundreds of lightyears away. I am a chemist with little need for a lab coat; my only connection to the chemicals I study is electromagnetic radiation signatures collected by a telescope. Using isotope ratios, I am tracing chemistry back to its interstellar molecular origins. I am an archaeologist figuring out where an artifact came from—only my map is in the stars and I chisel away at my dig site using computer code.